Maia and I made some more Christmas cards together by printing with styrofoam — the first activity on our advent calendar. This was our second attempt at how to do styrofoam printing — this time we were much more successful! The materials make all the difference! We used printing ink instead of tempera paint, a proper brayer instead of a paint roller, and thicker styrofoam (from a meat tray) instead of a thin styrofoam plate. To begin, cut the thin paper to be the same size as the styrofoam sheet you’ll print with. Then, draw a picture on the thin paper first. This step is optional, but it means you can draw a few different designs before choosing which one you want to print. It also makes it easier for younger children to transfer their image to the styrofoam. 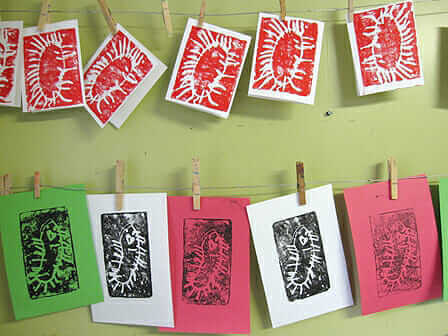 Maia made a couple of small drawings to use for her prints, a sun and a “Christmas octopus”. Hold the drawing in place over the piece of styrofoam and trace the drawing with a pencil. You can also use the pointy end of a paint brush, a chopstick or something similar. Press down firmly, but evenly while tracing the image. Gather together a brayer, an acrylic box frame (we use the same one for monoprinting — these are so useful! ), two colors of block printing ink, blank cards (watercolor paper folded over), a spoon, and the styrofoam plates (drawings). Squeeze some ink onto the plexi frame and spread it around with the brayer. 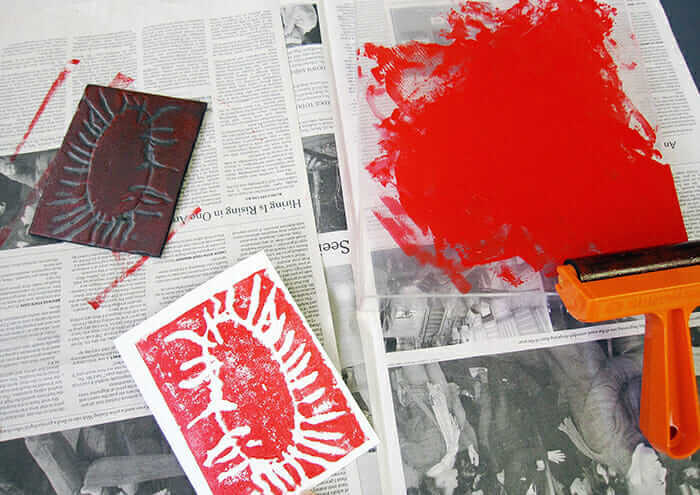 Once the brayer is coated with an even layer of ink, roll it over your styrofoam drawing. Position the styrofoam on top of the paper or card and use a spoon to rub over the paper to help transfer the design. Et voila! Many styrofoam printed suns and Christmas octopuses (octopi?). This was so gratifying and fun that I wish we had learned how to do styrofoam printing long ago! With the right materials. Our brayer is an old one that my Grandma passed on to me, but you can buy them at art supply stores or on Amazon. very cool! I need to check into getting printing supplies did you get it a craft supply store or art supply? This is fantastic! What a great idea to use styrofoam. And the suns and octopuses are so fun. One that sells both. If you had to choose, though, I’d look at the art supply store. These turned out so beautifully. I can’t wait to try it. It’s so cool you tried styrofoam printing on the sheets of paper of different colour! The black one on green looks very interesting. oh this is completely glorious… i love this! Hobby Lobby used to carry the ink and brayers (at least they did six months ago) in their art supply section. Can it get any better than a Christmas octopus?! Those are so great. We did the same thing last year for our holiday cards and I have been saving meat trays in hopes of doing it again this year. Something so satisfying and fun about seeing the images emerge on each card. Here’s what ours looked like last year. We used acrylic paint so I will be eager to try block printing ink. I just did a project similar to this one with some friends last weekend. It is always so rewarding seeing all the prints pile up on the drying rack. Am very curious to try this with my two year old. I love your idea of drawing on paper first and then tracing the image onto the plate. A Christmas octopus! Just what I would hope to find in my stocking. We tried this last night and it worked great! We asked the butcher for some new styrofoam meat trays and they were perfect for the project. Loving this site with all the ideas i can use for projects that i need to plan. Great work! 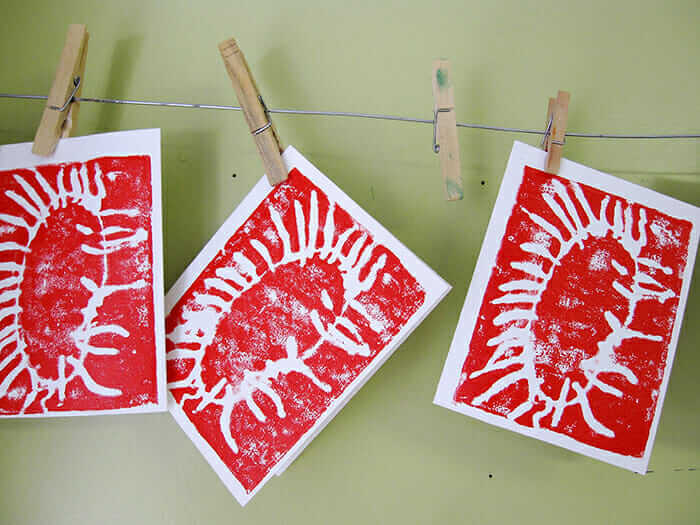 This is one of my favorite crafts to do with preschoolers. It’s a fantastic open art project with little to no materials cost, perfect for the public library setting. You’ve done a great job of presenting and explaining it. The only thing I do differently is to have children draw their design directly onto the styrofoam, and the only difficulty is getting them to press hard enough to indent their design. I am new to blogging and a new teacher. I had started a post with styrofoam printing, as I had done this in a Uni prac with Kindergarten children, and noticed your beautiful tutorial! Would you mind if I linked your tutorial to my post! love it, love those plants!